The Forgotten Realms are full of gods. Big ones, small ones, itty-bitty weeny ones: each oversees a domain and grants spells to its devout. Over the long years, gods have schemed and murdered each other with abandon, eventually taking a back seat to let mortals drive their own affairs. Lest they be forgotten, however, the gods imbue their power into mortals wherever faith waxes strong. Chauntea brings a full harvest to the devout. Beshaba holds a bridge aloft for just long enough for you to cross safely. Sune takes away her grace, and curses the unfaithful to walk the earth as monsters. The workings of the divine are everywhere, for those with an eye to see them. Presented within are three mechanics for representing these blessings, usable as you see fit. Piety lets you grow strong by walking as an exemplar of a God's innate talents. 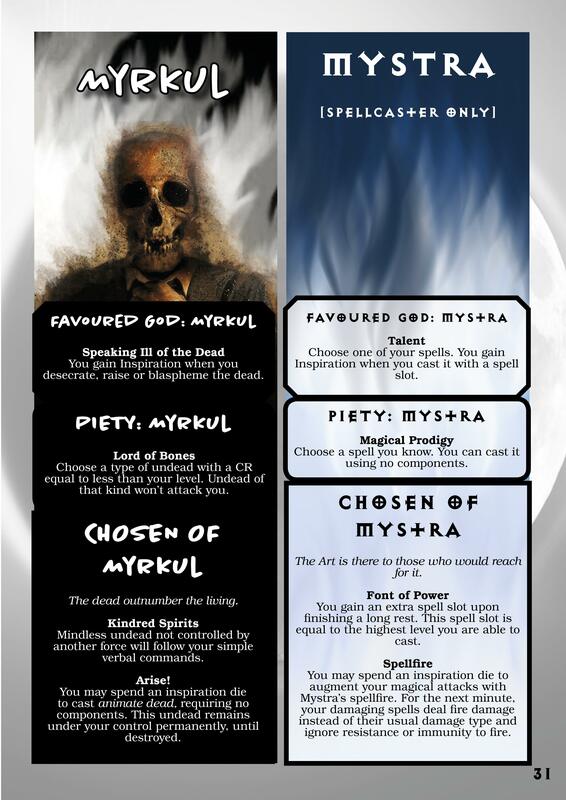 Choosing a Favoured God grants mortals Inspiration for acting in accordance with a God's dogma. And those special few who are Chosen? Well, then things get interesting. I love the mechanics and implementation of these. 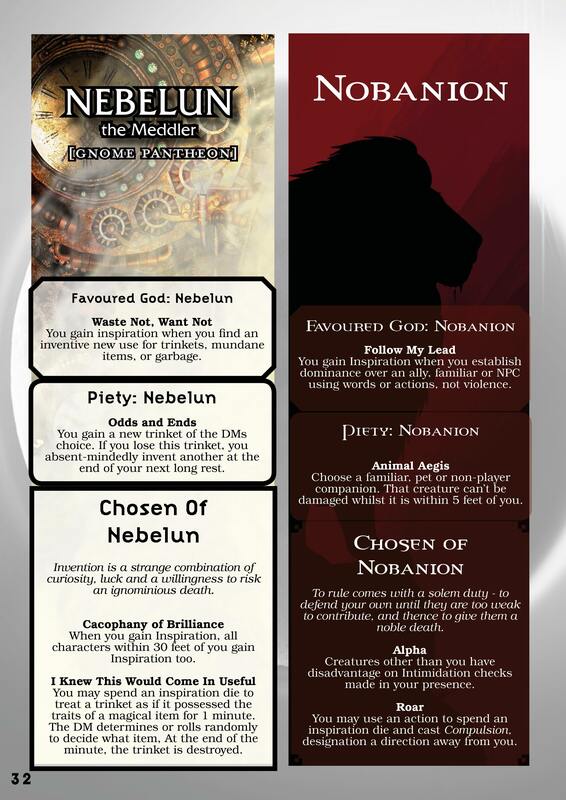 Is there any intent to create some of these for gods of other pantheons? For example, the Dragonlance or Greyhawk deities? I'd love to, though the DMsguild license prohibits authors publishing anything Dragonlance/Greyhawk related at present. We're restricted to the Forgotten Realms/Ravenloft. Personally I love Dragonlance, so if that ever becomes an option, I'll certainly be doing it. Ah, that's a shame. 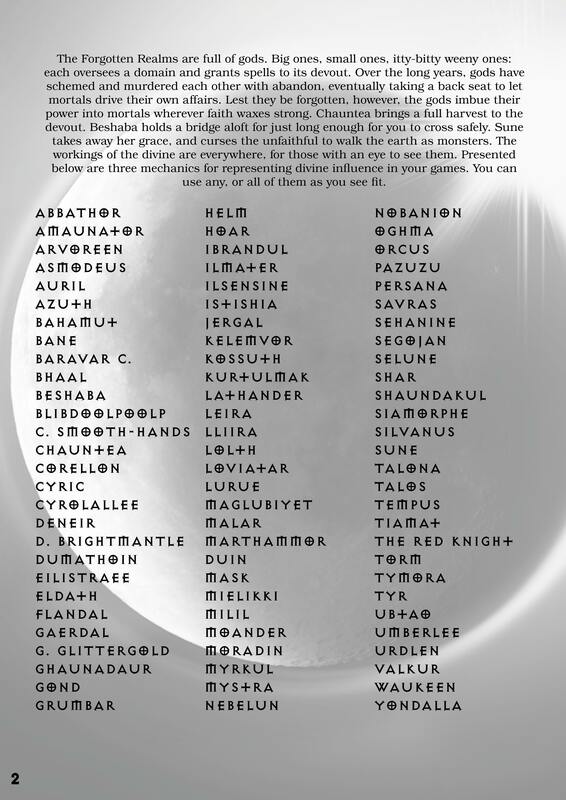 My campaign setting is using the Dragonlance gods, so I was hoping for those. Guess I'll have to use the ones here for inspiration to make something serviceable.